We’ve had it before: Aliens versus Predator, Cowboys versus Indians, even more recently Cowboys versus Aliens, but where there may have been some doubt as to who might win in those films, when it comes to Horses versus Machine Guns the answer can only be a very chilling and upsetting one. War Horse, derived from a novel by well known children’s author Michael Morpurgo, has been turned into a big screen adaptation by Spielberg. 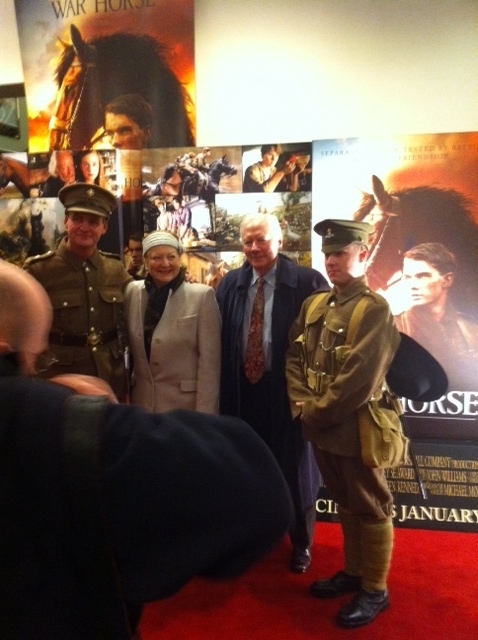 Maria @mgolpe and I were lucky enough to be invited to the Irish Premier of the film in the Savoy Theatre on Thursday 12 January. 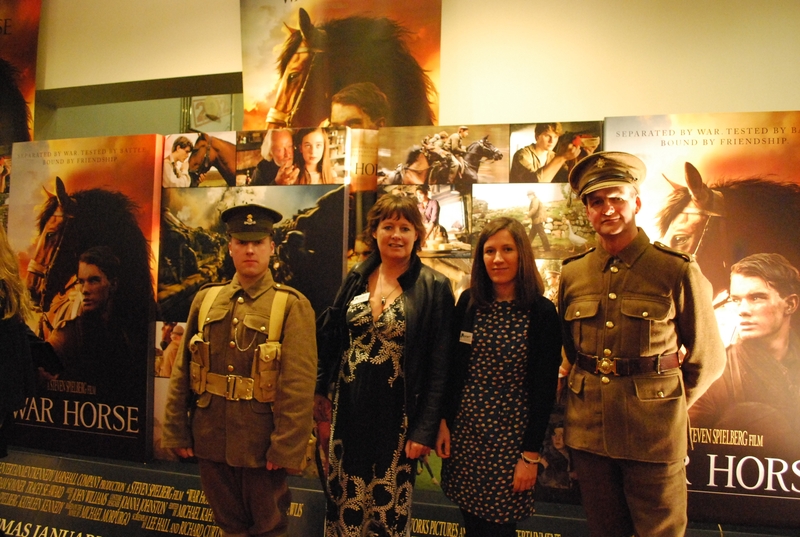 We were representing the Irish Horse Welfare Trust (www.IHWT.ie). It was a great honour to be invited especially as we discovered we had ‘reserved seating’ in the theatre. This basically allowed us to take pictures and chat with some of the celebrity guests without worrying about finding a seat in the amphitheatre. 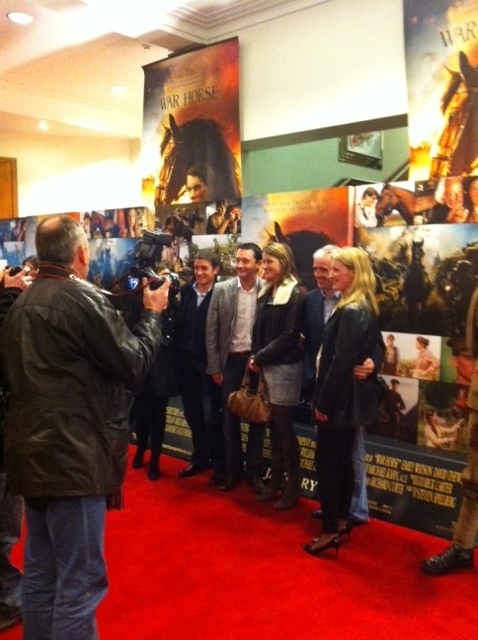 There were some big names in racing, Ruby Walsh and David Russell and friends. There were some big names from television, Gary Lydon, Gaybo, Joe Duffy and Glenda Gilson. Martin King from TV3 was there and he told me that he’d seen me on the bookclub on IrelandAM (http://practicepr.wordpress.com/2012/01/10/my-watch-is-trending-on-twitter/) but he didn’t mention my watch. Maybe that was because he’d brought his young son with him. 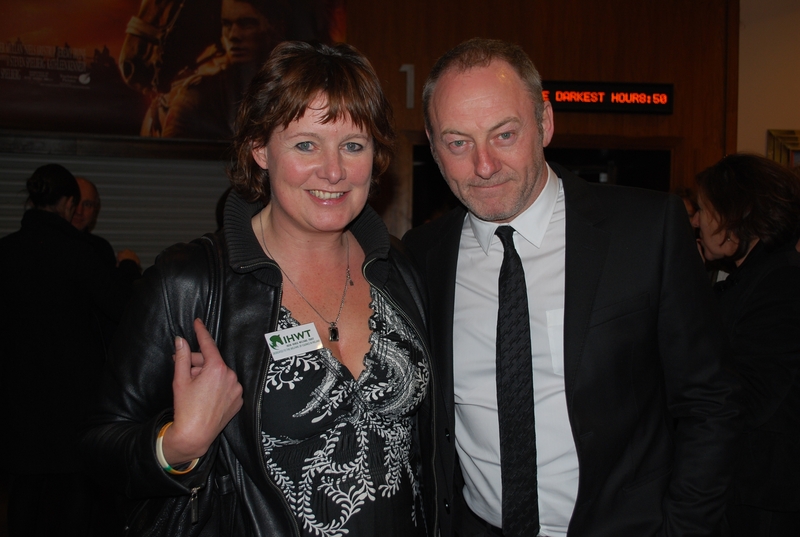 Liam Cunningham, actor and the surgeon in the film, was also on hand with his mother. 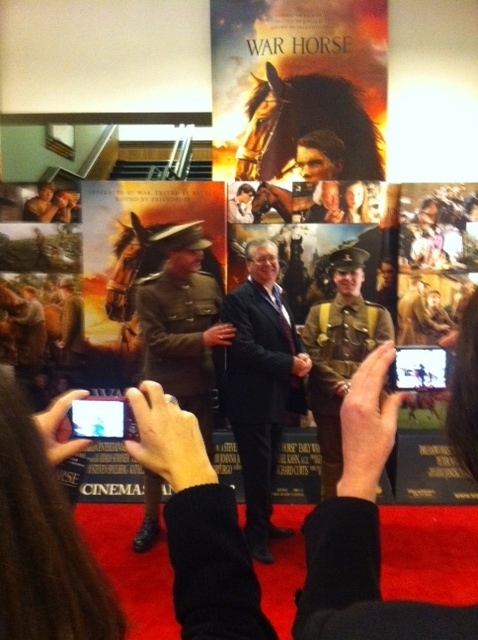 He was terrific in the film, but also as an ambassador for the film. 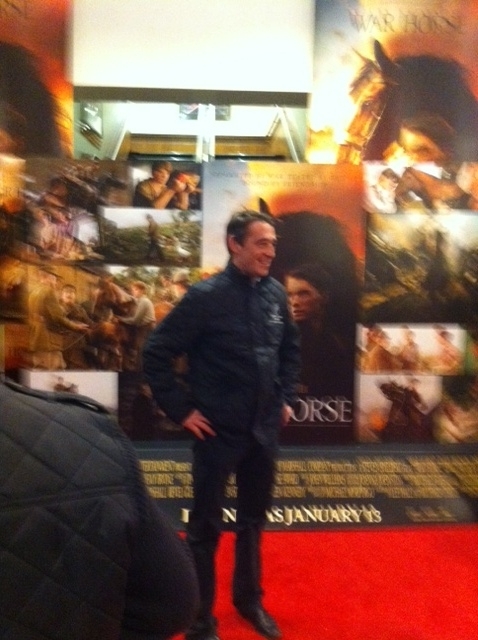 Beforehand and afterwards he was very patient, entering in photographs for fans and talking to everyone. He very kindly agreed to pose for a photograph with me taken by the resident Practice PR photographer, Maria. He even listened politely as I spoke a little bit about the charity. The film itself was good. Maria and I did not cry, although we had stocked up on hankies beforehand. We did laugh quite a bit though which was a pleasant surprise. There are a few harrowing moments in the film. It is always harder to see animals, and especially horses, hurt than humans, especially soldiers. Horses are no match for machine guns, nor barbed wire, not mines, nor sheer brutal working. One of the scenes reminded me of prisoners being forced to work on the TransSiberian Railway, only watching horses being mistreated is more upsetting than watching the same treatment being doled out to prisoners even. It is not that I think horses are more important than humans, just that seeing them ill-treated or even being killed is somehow more upsetting than watching the same for humans. It’s like kittens or puppies if you get me. Anyway, there are some upsetting scenes, but not too scary for children or horse lovers. On the long journey back to the sticks after the film, Maria and I agreed we had thoroughly enjoyed ourselves. The only criticisms were in the beginning and the end. We definitely liked most of the middle. The beginning was a little mawkish, too sentimental and awkward. The young boy’s relationship with the horse was too glitzy. It was more like how one imagines a growing relationship between a boy and puppy, than a boy and colt. Also, the boy’s love for Joey (the horse) was a little too romantic and doe eyed. Too many wide eyed shots of the young man made us feel uncomfortable. Then again at the end, the final home coming shots reminded us of Gone with Wind and all that colourful sky stuff and silhouettes and poses. I understand that Spielberg was shooting in digital for the first time and it kind of showed. Less red sky next time please Mr Spielberg. Finally, we discovered that in all some fifteen horses were used to represent Joey in the film. That explains why in some scenes he looked little more than a pony and in others, he seemed a full horse. Or perhaps it was just the angle. Our verdict? Great film, well worth seeing and don’t worry tissues are optional.